Nite Jewel (née Ramona Gonzalez) may not have been on the eighties retro bandwagon early enough to put her feet up on the seats, but she is one of the few musicians who also uses her keyboards (presumably Casio) to pay tribute to the electro-thump of the nineties. JT The Bigga Figga wishes he had created a beat as seductive as “What Did He Say,” the gem of Good Evening. Unfortunately, most of that release consists of eight-track recordings that come across as more hasty than intimate. 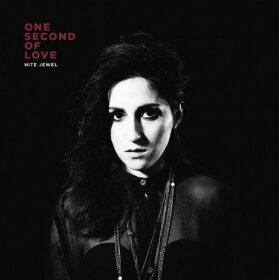 The first moments of One Second of Love thankfully announce cleaner production, more inviting melodies, and decipherable vocals. Opening with the lyric “I’m a broken record, you have heard this before” is rather cheeky considering “This Story” is a swaying, Sweet Sensation-esque slow jam. The lively title track picks up the pace, reminiscent of a time when deep sustained synthesized thuds intended to psyche up listeners instead of plunge them into gloom. Familiarity reigns supreme on One Second of Love, from the Everything But The Girl bop of “In the Dark” to “Autograph,” smooth jazz practically begging for a guest verse from San Quinn or another notable independent Bay Area rapper.